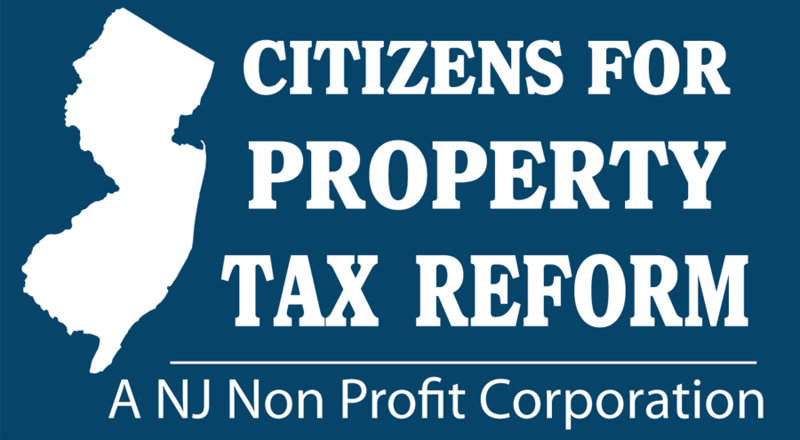 NJ Citizens For Property Tax Reform - NJ Citizens for Property Tax Reform, A New Jersey Nonprofit Corporation: Mission Statement. "If you are fed up with the broken promises of our elected officials and you are sick and tired of seeing your property taxes go up year after year with no end in sight, this is your chance to do ﻿som﻿ething about it." Our mission is to bring fairness to our property taxes in New Jersey. As of April 2018, our organization has been in existence for two years and during those two years, we have tried to make a change. We asked, begged, pleaded and implored the legislators to do something about property taxes. Most legislators are either incompetent, corrupt or unwilling to stand up to special interests. Only few are willing to do something about it. Property taxes have been our number one problem in New Jersey for the past 40 years. Things are guaranteed to get worse unless we, homeowners and taxpayers, take direct control over how our taxes are spent. Change won't happen if we keep electing the same politicians. As of April 2018, this is the summary of our findings from the past 2 years: It's a Sad Reality! There will be no property tax relief in New Jersey as long as the current politicians are in control, currently the Democrats. There will be no property tax relief in New Jersey as long as the public unions and special interests control these politicians. There will be no property tax relief in New Jersey until we cut spending and that means bringing the public employees’ benefits (Healthcare, pension, sick and vacation days) on par with what employees receive in the private sector. There should be no reason why we need to mortgage our homes in order to pay for their Platinum health plans, pension for life, 30 days vacation and 20 sick days every year, when we don’t get all these benefits in the private sector. Furthermore, these lavish benefits are not sustainable and we can no longer afford them anymore. The only way to have anything done in New Jersey is to curb the influence of the N.J.E.A and the public unions on our political system and to get rid of those politicians who are controlled by them. That’s the only way to stop the damage they both inflict on New Jersey every single day. It’s time for us, NJ homeowners and taxpayers, to have our own candidates run on a taxpayer platform, against any Democrat or Republican opposed to changes. And no, we are not running a third political party. We are just a movement. Soon we will start the process of assembling our candidates, so if you or someone you know are interested in running on our platform, please let us know. Once elected, our candidates will propose our reforms as constitutional amendments for the public to vote on. In other words, YOU, the voter will be able to decide what reform to enact. YOU, the voter, will be able to control your future and decide where your tax money goes, instead of leaving the decision to some politicians who serve the needs of public unions and special interests instead of serving yours. Proposed reforms as constitutional amendments to be approved by the voters. 1. Freeze all property taxes and all public sector employees’ salaries until the public votes on our reforms. 2. Public employees benefits reforms: Bring them in line with the private sector. These reforms will apply to new hires only. The current system will continue unchanged for current employees, since it was promised to them. So we don’t see any reason why public unions would object to our reforms. In fact, current public employees, especially teachers, are encouraged to support our reforms, for the simple reason that their pension fund is expected to become insolvent in 2027. Once insolvent, the ax will fall on everybody, including their own current benefits. So our advice to public employees and public teachers: Support our reforms to protect your own current benefits. Health benefits: Silver level plans, like the private sector. Their current Platinum plans cost upwards of $40,000 a year per public employee. Pension: Switch to 401k type plans like the private sector did many years ago, to be fully funded every year. Under a 401K plan, their 6% contributions would be matched and fully funded every year with no further liabilities. Currently, our pension system has a deficit estimated at 200 billions dollars and is growing every year. How can we keep providing them with lifetime pensions when we can't pay for them anymore? Retirement age to follow the federal guidelines, currently at 67. Vacation, holidays, sick days to match the private sector. Use them or lose them sick and vacation days. There is no reason to see another police captain retire with a $600,000 pay out for unused sick and vacation days. Make New Jersey a Right-to-Work State for Public Sector Employees - Updated June 2018: This was one of our original suggested reform, however this reform is no longer needed as it has already been decided by the US Supreme Court in June 2018 in the Janus v. AFSCME case. Now, all the states in the nation are practically Right-to-Work states, which give every citizen the right to work for the State without being forced to belong to a public union. This will eventually free our State from the grip and monopoly of the public unions. 4. Property Tax Reform and School funding. Consolidation of districts. There is no need to keep over 600 school districts in our state. It's time to consolidate these districts. School choice: The N.J.E.A. wants you to believe that public schools are the only option to provide the best education possible. Unfortunately, they are wrong. The public schools have proven to be expensive, bloated and less effective than any other schools. Parochial, private, charter and other schools are much more effective and much less expensive. Unfortunately, the N.J.E.A. uses the public schools only to serve its own political interests. It does not matter if you don’t agree with every reform we are suggesting. Remember, YOU the voter will decide what reform becomes part of our constitution when it's time to vote on these amendments. Our mission is to win enough seats in the Legislature to tip the balance towards the homeowners and taxpayers, and along with other taxpayers friendly lawmakers, to give you the chance to vote on these constitutional amendments. Soon we will start the process of assembling our candidates, so if you or someone you know are interested in running on our platform, please let us know. What’s the alternative to our plan? Do nothing and watch your property taxes go up every single year, like they've done in the past 40 years. Do nothing and you will have only yourself to blame for you higher property taxes in the future. It’s all in your hands. But remember, that’s exactly what the N.J.E.A. (Teachers unions) and the public unions want you to do: DO NOTHING AND KEEP PAYING!